Sha Cage and e.g. bailey, the multi-disciplinary duo from the Twin Cities are bringing together all the elements – not just in terms of hip hop, but the elements of community building and social change – for a new Madison radio show that showcases underground, conscious hip hop and spoken word. The Cipher Zone, which debuted on WORT 89.9 fm last Saturday, is what bailey calls the “changing station” on the “underground railroad:” a Midwest coalition of artists, organizers, activists and educators coming together over the airwaves to enrich and build community with positive words and hot beats. 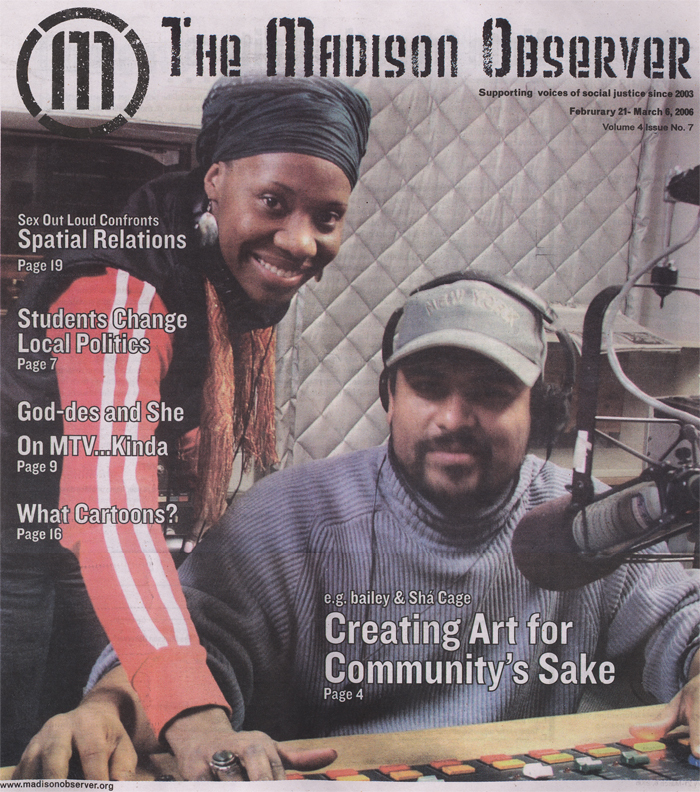 bailey says Madison is the hub of the network because of its convenient geography just a few hours from the Twin Cities, Chicago, and Ann Arbor, and even closer to Milwaukee, but also because of the common vision shared among bailey, Cage and Youth Speaks Wisconsin Director Willie Ney, who is also the executive director of Cipher Zone. “Part of our vision is connecting with common people doing common things around the country and building communities, that’s how movements are formed,” says bailey. The Cipher Zone already has a large collective behind it in Madison that includes a number of “homegrown” (as bailey puts it) hip hop and spoken word artists as well as Elements of Change, the local organization that educates youth through a hip hop-based curriculum. Cage (a spoken word artist, playwright, dancer, filmmaker, actor, painter, and teacher) and bailey (a spoken word artist, playwright, actor, film, music, and video producer, photographer, and teacher) know the value of collaboration in a community context: they have individually and together established multiple art collectives, written, produced and directed plays and movies, and pioneered two radio shows in the Twin Cities that also focus on the positive underground scene. Cage, who is originally from Mississippi, and e.g., who moved to the U.S. from Liberia when he was 10, find Midwest cities to be ideal for their work because they are big enough for artistic growth and freedom, but small enough to feel intimate and forge close relationships and partnerships. Cage and bailey apply their cross-disciplined energy to their radio shows by combining spoken word with old, new, underground, and even mainstream hip hop (“every artist has at least one conscious track,” says e.g. ), along with in-house djs and interviews with homegrown, nationally and internationally recognized artists. bailey says seeing the young performers at the national Youth Speaks competition last year was one clear sign that they are having an impact. “Seeing 300 youth writing incredible poetry and performing so powerfully with such a clear message tells me that something is real, something is powerful, something is connecting,” says bailey. “In Minnesota, there were tons of people that didn’t have any idea that there is a side to hip hop that’s not gangsta rap,” says bailey. Cage and bailey say they do not know where their underground railroad will take them, but they know the potential it has to change the way the Madison community perceives hip hop. But Cipher Zone and the hip hop community as a whole has some work to do. With community members calling for the removal of Club Majestic’s liquor license, the police cracking down on graffiti artists and night clubs banning hip hop-associated apparel, many Madisonians have a long way to go before they shed their stereotypes of hip hop. Even so, bailey and Cage will have the help of the socially conscious hip hop community that is already thriving in Madison. bailey, at least, remains optimistic at the show’s ability to help change Madison’s perceptions of hip hop.